The Best Professional Carpet Cleaning Tip in Birmingham AL is a very simple tip. Basically, the best thing you can do for almost any spot or stain is to try to blot it up immediately after it occurs. If you can blot up most of the spot or stain with a clean towel, rag or paper towels as soon as it happens, it can save you lots of work later. The longer a stain sits the harder it is to get out. Unfortunately, often we don’t have time or don’t even know when some stains occur, so it is difficult to clean them up immediately. Even if you know a stain occurred, you may be out the door or just have other priorities, so you can’t get to it right away. This is where Heaven’s Best Carpet & Rug Cleaners can help. We have very strong professional strength cleaning solutions that can get all sorts of stains out, even if they are dry and set in. If you start putting chemicals on a stain and you don’t know the correct solution to use, you can actually set a stain into the carpet and make it worse. So, you may be better off calling a professional carpet cleaner like Heaven’s Best Carpet & Rug Cleaners. We will assess the stain and then choose the correct solution to use to get it out. So, first try this Professional Carpet Cleaning Tip in Birmingham AL; blot up as much of the stain as possible and do it as soon as possible. 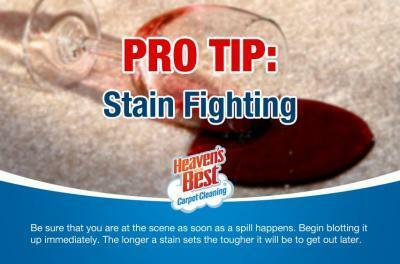 If this does not work, or you didn’t get to the stain quick enough, call Heaven’s Best Carpet Cleaning at (205) 618-9150. We will save you the hassle!